Staff Colonel Hasan Ahmed Mohammed, Head of the Planning Department, Royal Bahrain Naval Force and ADSB CEO Bill Saltzer with ADSB management and employees inside the first hull block constructed for the landing craft. 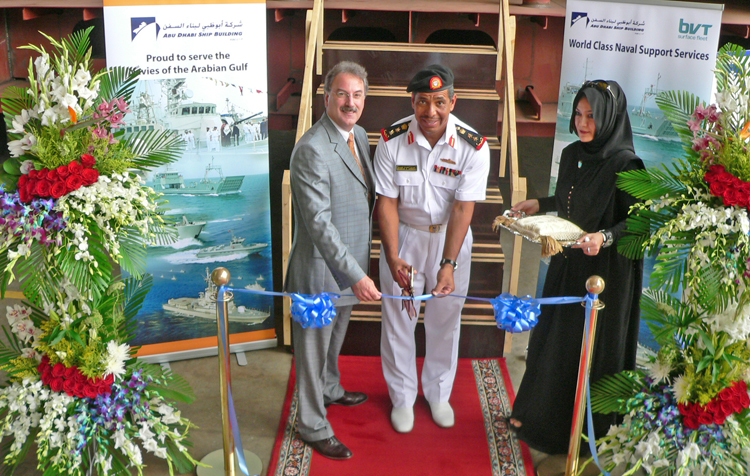 Staff Colonel Hasan Ahmed Mohammed, Head of the Planning Department, Royal Bahrain Naval Force cuts the ribbon at the keel laying ceremony with ADSB CEO Bill Saltzer. Abu Dhabi Ship Building (ADSB) has begun work on the first of two steel landing craft being built for the Royal Bahrain Naval Forces. The contract for the 42m vessels was won against stiff competition from international shipyards, further confirming ADSB’s position as the region’s leading provider of support services to GCC navies. It is ADSB’s first new building contract for Bahrain and also includes two 16m Sea keeper landing craft constructed in composite materials. A traditional keel laying ceremony was held at ADSB’s shipyard at Mussafah, Abu Dhabi, to mark the start of work, attended by Staff Colonel Hasan Ahmed Mohammed, Head of the Planning Department, Royal Bahrain Naval Force, who praised the standard of construction at ADSB. ADSB CEO Bill Saltzer said: “This is a highly significant export contract for us. We look forward to performing the work on time, on budget and with the excellent quality that ADSB as a company demands and that our customer, the Bahrain Navy, deserves. The 42m vessels, based on vessels in service with the UAE Navy, are designed for troops and vehicle or cargo transportation and for beach landing in Gulf waters. The Bahrain vessels will be the first built using new Aveva Marine 12 software which enhances ADSB’s capability in production engineering and brings greater efficiency to the shipbuilding process. The hardware, software and training of the system represents a Dh2 million investment that provides ADSB with a state of the art capability to develop designs from scratch using the very latest computer aided design (CAD) tools. The first steel landing craft is due for delivery in July next year and the second in February 2011. Meanwhile work is also well underway on the two Sea Keepers for Bahrain with delivery scheduled for September this year. The vessels, capable of speed in excess of 30 knots can carry two Hummer-sized vehicles and are designed for the rapid supply of vehicles and equipment. While this is the first Bahrain contract for the building of new vessels, ADSB is currently in the final stages of a two-year contract to refit and upgrade ten patrol boats for the Bahrain Coast Guard. 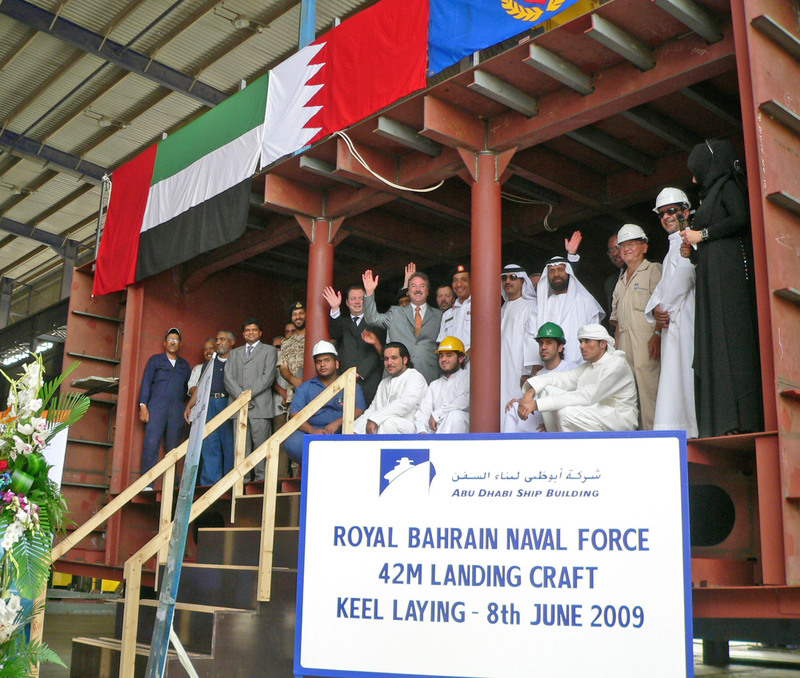 When it was signed in 2007, it was the shipyard’s first major refit project on Coast Guard boats from another GCC country. The contract provides for the complete refurbishment of the 18-year-old boats which are made of composite materials. The work includes new propulsion and auxiliary machinery, accommodation facilities and navigational equipment and is undertaken at ADSB’s highly advanced composite workshop, the largest facility of its type in the region. Work on six boats has already been completed and the final four boats will be delivered by October this year. ADSB Program Manager Glen Walsh, who has been in charge of the project, said: “We are extremely pleased with the progress of the contract. It has been our first contract for the Bahrain Coast Guard and the cooperation we have received from the Coast Guard team has played a major part in ensuring the work has gone smoothly. Accommodation: Three cabins for officers and crew and seating for 136 troops. Propulsion: Twin Rolls Royce FF Waterjets powered by two Caterpillar marine diesels.